Hi friends, hope you’ve had a great summer. We took a little break from the blog as we have been in Copenhagen and Barcelona. But we are back now with a great little dinner recipe. It’s a version of something we have been eating all summer. 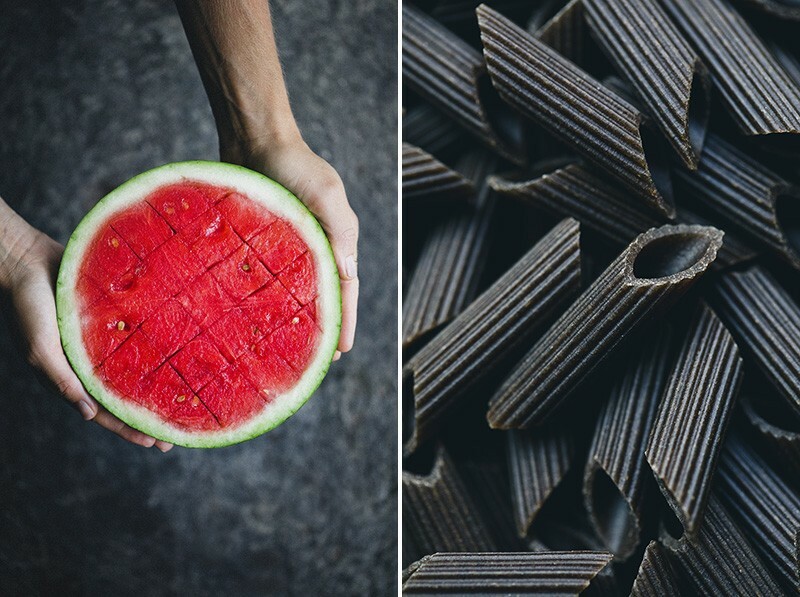 It has been record-breaking hot in Europe so pairing lukewarm buckwheat penne with juicy and crunchy watermelon has been feeling very right, very often. Satisfying, simple and soothing. 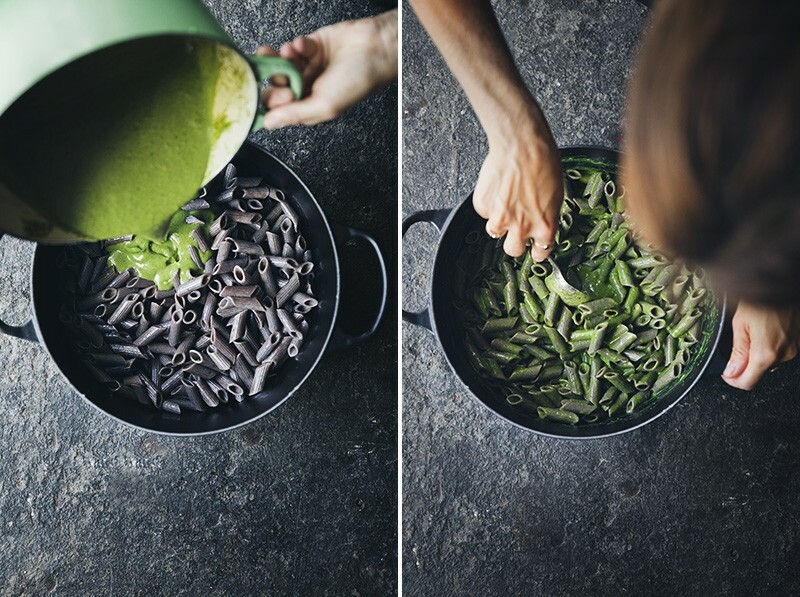 Our kids love this buckwheat penne and that also plays a part why it’s been on repeat. In fact, our little Noah (soon two years old!) starts crying if we serve him spaghetti or any other pasta: “Noooooh, [I want] my pasta“. 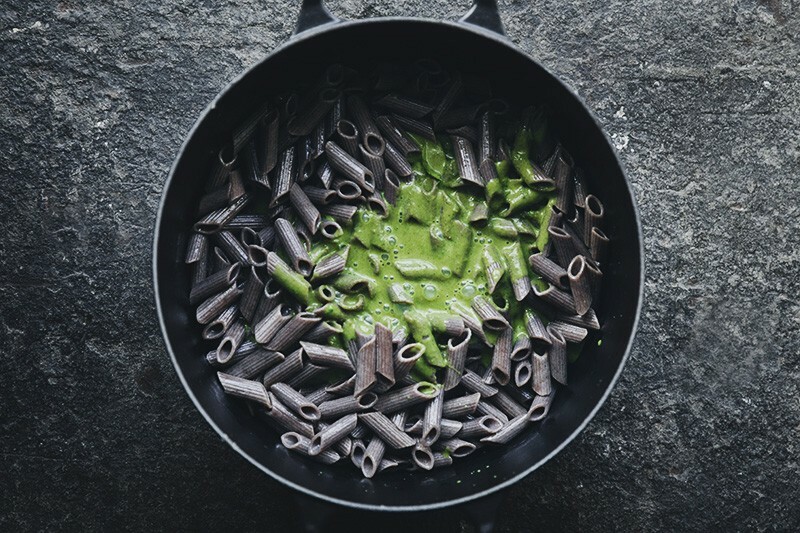 In this version we are dressing (almost drenching) the pasta in a herby spinach, herb and almond milk sauce that is inspired by something we saw in Deliciously Ella’s feed a while back. It’s very good, creamy and quick! 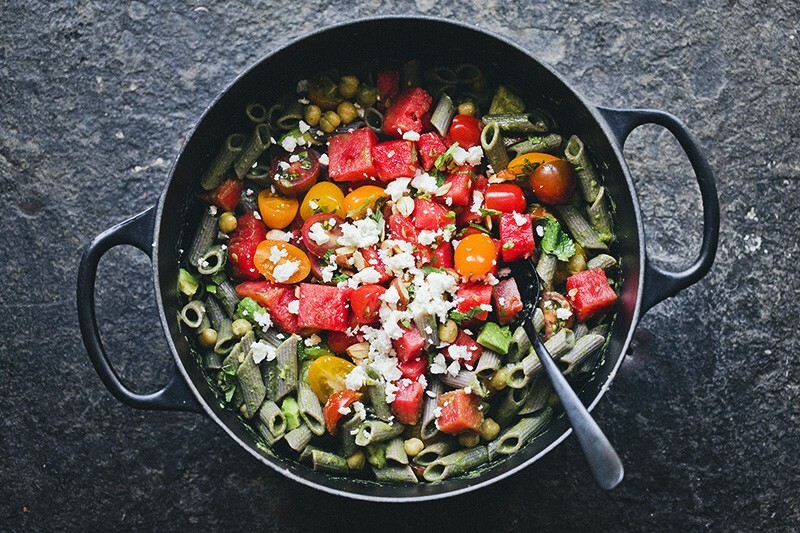 We then stir in chickpeas and avocado and top everything with watermelon, feta cheese, almonds and heirloom tomatoes. It is a pretty awesome little dinner that can come together in 15 minutes if you are quick with the knife and good at multitasking. There are plenty of ways to spin this. • If you cannot find buckwheat penne you can of course use regular or whole wheat penne. • Vegans can just skip the cheese (and perhaps add in a little nutritional yeast for extra flavour). • Fresh or roasted corn could be a great addition when they are in season. • You can swap basil and mint for cilantro and parsley for a more Middle Eastern take. • If you are allergic to nuts, use oat milk or regular milk and swap the almonds for toasted sunflower seeds or pumpkin seeds. 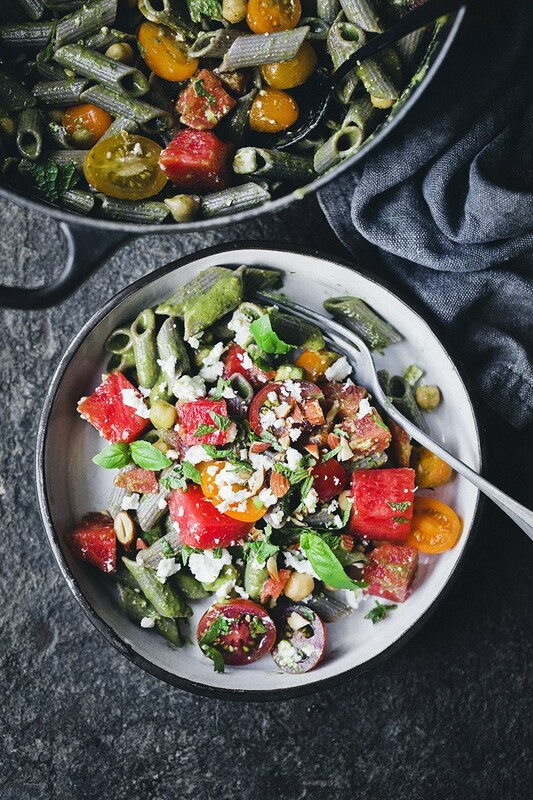 • For a wintery version of this, you can add in roasted broccoli and pomegranate seeds instead of watermelon. Boil salted water in a large saucepan, add the pasta and cook according to the instructions on the package. Meanwhile prepare the sauce. Peel and chop onion and garlic. Heat olive oil in a saucepan. Sauté onions and garlic on medium high heat until translucent and light brown. Then lower the heat, add spinach and let it wilt down, pour in almond milk and let simmer for a couple of minutes. Add the remaining ingredients, take it off the heat and use a stick (immersion) blender to mix it smooth. Taste to check that the flavours are balanced. You can add more lemon juice, herbs, salt or maple syrup if you prefer. When the pasta is ready, drain the water in a sieve, give it a quick rinse and transfer the pasta back to the saucepan along with a splash of olive oil. 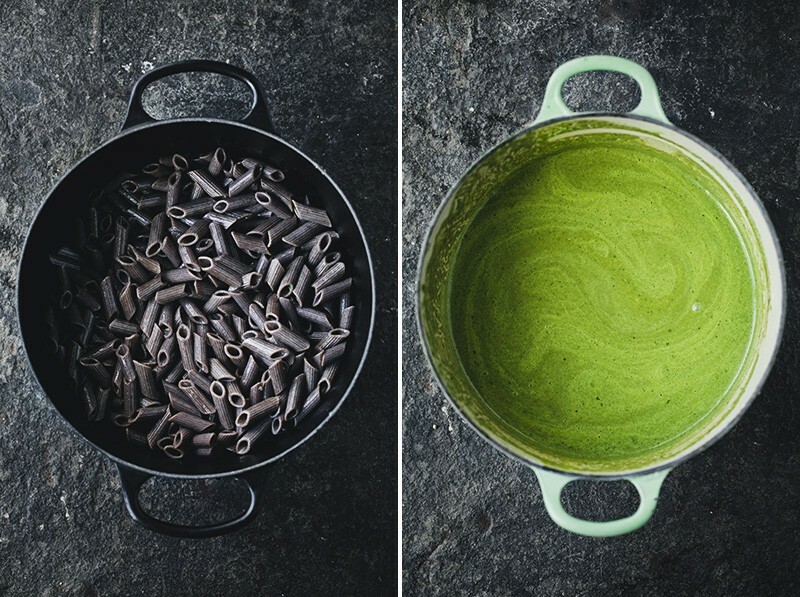 Pour the spinach sauce over the cooked pasta and stir to combine. Drain the chickpeas and cut the avocado into cubes and add them to the creamy pasta. 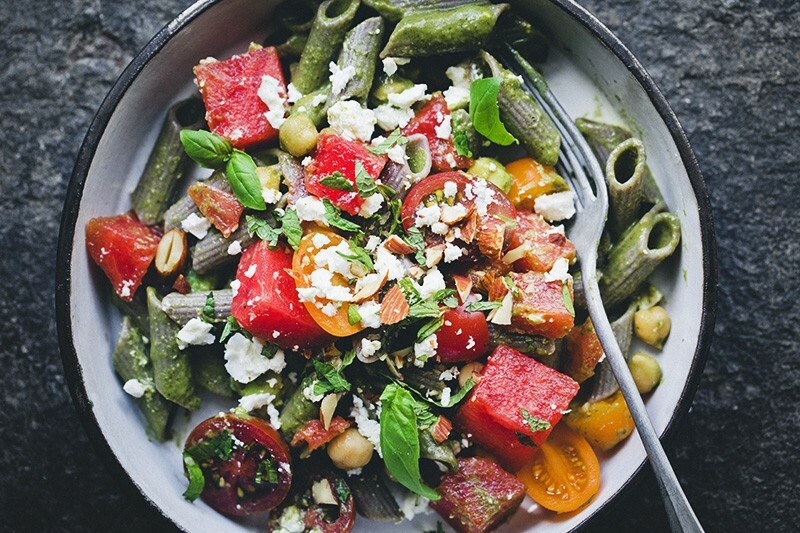 Cut the watermelon into cubes, divide the tomatoes in halves, chop almonds and mint and crumble the feta cheese. Arrange all those ingredients on top of the creamy pasta penne. Serve and dive in!